Its almost a month when fourth Session of Indian Premier League started. So far we have seen many interesting games and movements in IPL 4 while more are still to come. 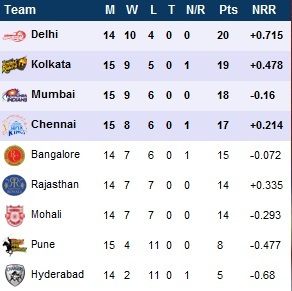 Till Saturday 30th April 2011 all the IPL teams have played 7 to 8 IPL Matches after which Mumbai Indians is on first place by winning 5 out of 7 matches it played so far while Delhi Daredevils is at last spot by winning only 2 matches out of 7. Here is IPL 4 Points Table until 30th April 2011.